On Wednesday, the 26th of December, Our Lady left Oviedo and travelled almost 300 km. to the town of Santa Gruz de Laniz in Coruna province. The region forms the autonomous community called Galicia. There are two official languages here, Spanish and Galician. After the Icon crossed the magnificent overflow of the Ribadeo river, which empties there to the Bay of Biscay, Galician pro-lifers took over the care of the Icon in their own region of Ribadeo. 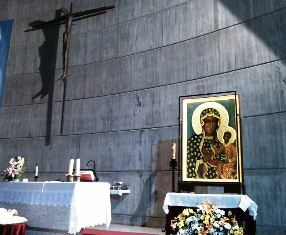 The Mother of God in the Częstochowa Icon stopped in the parish of St. Eulalia de Laniz in a small town of Santa Cruz de Laniz, in the county of Oleiros, near a bigger port city of A Coruna. After the solemn welcome the Icon was carried into the church. The Pastor of the Parish Fr. José Carlos Alonso Seoane celebrated the Holy Eucharist. In his sermon he encouraged the congregation to get involved in the pro life movement. At the end of the ceremony he sang a traditional beautiful song in honour of the Most Blessed Virgin Mary. On the next day people held individual adoration which ended with the Holy Mass at 7 PM. The Pastor explained the idea behind the peregrination from Ocean to Ocean in defence of life. At the end the Act of Entrusting the protection of the civilization of life and love into the hands of the Most Blessed Virgin Mary was renewed and the people sang the hymn “Welcome the Queen”.